In the next few days MAZ hopes to begin construction of a “MyPad” in Mangawhai. This is a project undertaken for MAZ by Colin and Jenny Gallagher to raise funds for our park. The house will be located on the corner of Devon and Moir Point Road. MyPad is not just a well designed bach, it’s “future proofed” so that it can transform from a bach into a permanent home. MyPad is eco friendly, healthy and energy efficient. 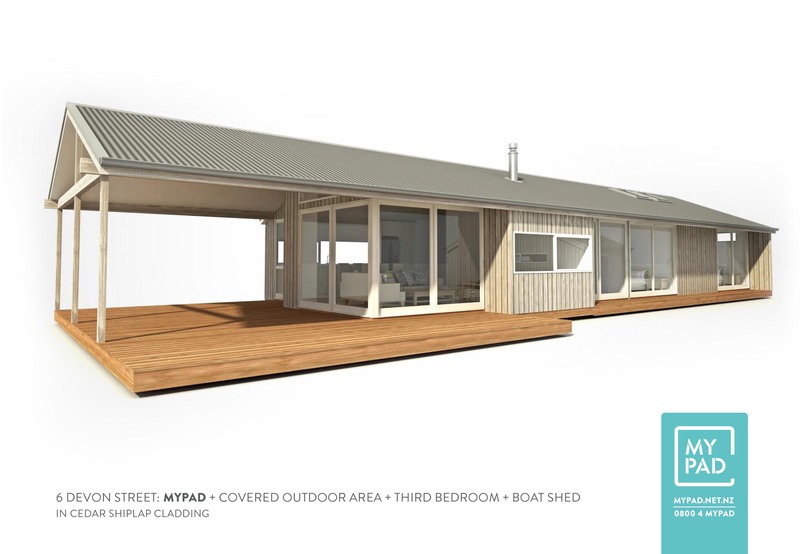 The MyPad to be built for MAZ will have three bedrooms, two bathrooms, a covered outdoor area and boat shed all on a 940 m2 site. It will have a 7 HomeStar rating and a Lifemark certification. Funds raised through this project will be used at MAZ to build an extensive wooden fort in the children’s playground area, a warm up / cool down exercise area at the entrance to the walking tracks, and commencement of stage III of the skate park “free flow” bowl. There will be open home days during January 2015 when the house is complete. The auction date is yet to be announced. Go over to MyPad.net.nz to check out designs. This entry was posted on Friday, July 3rd, 2015 at 6:23 am. It is filed under Events, News. You can follow any responses to this entry through the RSS 2.0 feed.